1. 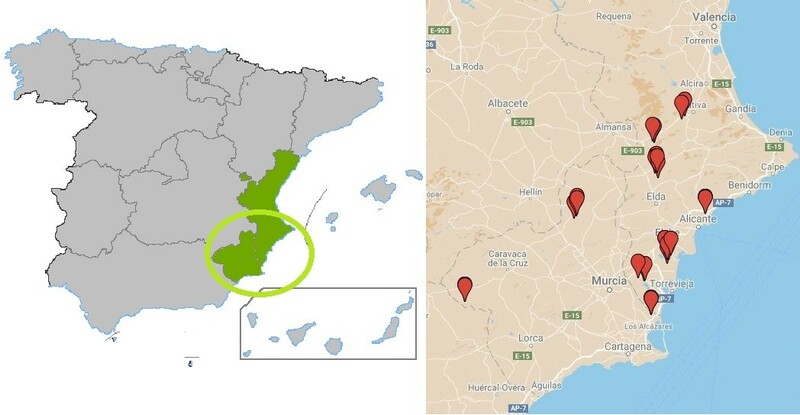 Geographical descriptionThe area of the study is located in the south-eastern of the Spain, enclosing study sites in Alicante, Valencia and Murcia provinces (Figure 1). The climate is typically Mediterranean, with 3-5 months of summer drought, usually from June to September with a mean annual precipitation ranging from 200-500 mm and a mean annual temperature of 16ºC. The area has an important agricultural activity, with the main crops being citrus in the lowest areas (under irrigation), and olive, almonds, vegetables, fruits and vineyards elsewhere (usually rainfed). Cereals are also grown. There has been an expansion of citrus crops in the last few years, with the transformation of dry crops and forest area into irrigated agricultural land. Figure 4. SE Spain study site location. 2. Main farming systems and typical agricultural management activities in the study area. The main crops are citrus plantations, rainfed vegetables, olive, vineyards, fruits and cereals. Rainfed areas are triggering high erosion rates, and also the new orange plantations increase soil losses. It is common practice to use wastewater and water rich in salt due to scarcity of water in this area, and in some agricultural areas this has a high impact on the soil with important loss of structure. Traditionally the main system of farming is based on the use of inorganic fertilizers and intensive tillage. As a consequence, it is has been noticed that the aquifer of the area is contaminated with specific pollutants. In recent years, an organic farming system with soil cover provided by leguminous species and pruning remains has been introduced. The use of adventitious plants and manure from sheep and goats are also being introduced in vineyards. 3. Characteristic soils and soil quality monitoring practice. Lithologies and soils are diverse, but soils are mainly developed under calcareous materials (limestone, marls), and on quaternary sediments. In the WRB (2010) classification they are mainly Regosols, Cambisols, Calcisols and Luvisols. Agricultural land management is one of most significant anthropogenic activities in the south of Spain that greatly alters soil characteristics, including physical, chemical, and biological properties. This fact is particularly relevant in Mediterranean environments, where unsuitable land management practices together with climatic constraints (scarce and irregular rainfall and frequent drought periods) can contribute to increased rates of erosion and other degradation processes on agricultural lands. These conditions can lead to a loss in soil fertility and a reduction in the abundance and diversity of soil microorganisms. Agricultural management influences soil microorganisms and soil microbial processes by changing the quantity and quality of plant residues entering the soil and their spatial distribution, through changes in nutrients and inputs. The excessive use of pesticides can drastically modify the function and structure. The quality of soils is low as a consequence of persistent agricultural practices including: intensive tillage, irrigation on slopes, which encourages water-based erosion, use of saline waters, and excessive use of fertilizers. Furthermore, these agricultural soils are subjected to semi-arid conditions with long dry periods; in general, they have low organic content and poor soil structure. Monitoring soil quality under different agricultural management (biological, physical or chemical indicators) (GEA-UMH). Promoting the increase of the use of organic farming system (GEA-UMH In collaboration with Consellería of Agricultura and Farmers association). Implement programs of education and training courses to farmers. García-Orenes F, Cerdá A, Mataix-Solera J, Guerrero C, Bodí MB. 2009. Effects of agricultural management on surface soil properties and soil-water losses in eastern Spain. Soil Till. Res. 106: 117-123. García-Orenes F, Guerrero C, Roldán A, Mataix-Solera J, Cerdá A, Campoy M, Zornoza R, Bárcenas G, Caravaca F. 2010. Soil microbial biomass and activity under different agricultural management systems in a semiarid Mediterranean agroecosystem. Soil Till. Res. 109: 110-115. García-Orenes F, Roldán A, Mataix-Solera J, Cerdà A, Campoy M. 2012. Soil structural stability and erosion rates influenced by agricultural management practices in a semiarid Mediterranean agroecosystem. Soil Use Manag. 28: 571-579. Morugán-Coronado A, Arcenegui V, García-Orenes F, Mataix-Solera J, Mataix-Beneyto J. 2013. Application of soil quality indices to assess the status of agricultural soils irrigated with treated wastewaters. Solid Earth 4: 119 -127.